Triathletes spend hours training for optimization of fitness and technique in the swim, bike and run. However, another aspect of the race often overlooked are the transitions: The period between the three athletic components. An efficient transition can mean a PR, while being less prepared and disorganized can cost an athlete precious time and quite a bit of mental distress. With input from two pro triathletes, plus my own observations from years of coaching and racing, I’ve put together a simple guide that can help any athlete shape their race day performance. In this first installment, we’ll focus on the first transition in a triathlon, when the athlete transfers from swim to bike, also known as T1. Her recommendation was to study the transitions in a race and be prepared for the specific elements of each. Every course is unique. Knowing the running surface, distance and elevation changes can assist in planning. Some races, including many long-distance events like IRONMANS, have wetsuit strippers who provide assistance removing your suit. Others, such as the Escape From Alcatraz and the Wildflower Triathlons, have long runs that are better executed with your suit kept on—air temperatures can contribute to this decision. For T1, or the transition from swim to bike, Amber suggests mimicking race conditions by practicing an exit from the pool or open water during one workout a week. For example, an athlete can try removing cap and goggles or unzipping a wetsuit while running. Catherine Sterling, an XTERRA and Cyclocross pro who excels at bike handling and expedient transitions, gave similar advice. PRACTICE! Take your wetsuit off. Try removing your cap and goggles. Set your bike up as you will on race day and then run over, put on your helmet and sunglasses and bike shoes if you aren’t leaving them on the bike, and run a short distance pushing your bike. Learn how to get on your bike in a smooth motion. You’re going to need to do this over and over. The swim to bike transition is unique because an athlete goes from the horizontal position in swimming to the vertical position in standing—and then has to run! This can be dizzying, especially if exertion was high. Understanding that this slight disorientation will pass, and figuring out how you can work through it will come from doing it in practice. Getting out of your wetsuit during this short period of disorientation can take some practice as well. You want to do this enough times before race day that you won’t waste mental energy or time with zipper woes. Practice finding your zipper while jogging forward and reaching an arm behind your back. If you want to learn how to leave your shoes on your bike for mounting and dismounting, this has to be incorporated early into each bike ride. Repeat it over and over until it feels easy. My recommendation to beginners is to put the shoes on your feet leaving transition, but learn how to leave them on the bike coming back into transition. 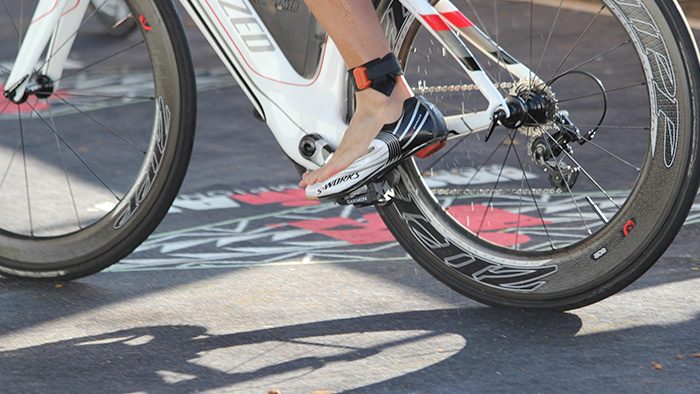 Some races don’t allow shoes on the bike, so check with race rules before making a plan. These items don’t take up a lot of space, making it far easier to find things when you arrive in the transition zone. Know the transition area. Walk around, ask volunteers about the entry and exit points. Make sure you are aware of how to hang your bicycle properly. A USAT official is often walking around and can help. Bring a small, bright towel to mark your spot and then look around and make note of what landmarks you can spot from the swim transition entry point that will lead you to your bike. If the race requires you to store your transition items in a bag, mark your bag with permanent marker and obnoxiously bright duct tape. The transition area can look remarkably unfamiliar once it is full of stuff. When you get out of the water, push your goggles up onto your head so your hands are free while you remove your suit. In most situations, unzipping and dropping your suit to the waist is adequate. Run to transition, pull off your cap and goggles, and peel off the rest of your suit. Use Bodyglide or Trislide or another wetsuit-safe lubricant on the arms and lower legs of your suit. This will help the suit come off quickly. Ideally you can pull off one leg while standing and then use that leg to help release the other. Sitting and pulling can waste time, but practice various methods and see which is better for you. Socks or no socks? Rule of thumb for a lot of athletes is no socks for short course, socks for long course. Putting baby powder in your bike shoes can keep feet from chafing if you go without socks. If it is rainy or muddy, I’ve found socks help. A muddy foot in a bike shoe can mean torn skin. Put your helmet on! Leave it on the aerobars or somewhere you can’t miss it. Remember, it has to be buckled and secure before moving forward. Sunglasses can rest in the helmet so they are not forgotten. Race belts are good for numbers but check with your specific race to see if you need to wear it on the bike. If not, leave it with the running shoes. If so, hang it over the bike or put it over your helmet so you don’t forget. Have your water bottles already on your bike. If you are taking gels, blocks or other fuel sources, put them neatly by your shoes or belt so you put them in a pocket. Some athletes tape gels to the bike; this can work. Always leave an extra bottle of fuel in transition, as well as an extra of whatever else you are carrying in case you need it. Usually you won’t, but again, sometimes fuel gets dropped from a pocket, or temps change and you need more. Remember, most IRONMAN races require transition items to be stored in a bag; it helps to go through your transition set up the night before and then put the items in your bag. Mentally prepare! Spend time visualizing what you will do at each point of the transition process and couple that with knowledge of the race environment. Doing this will lead to less stress and more fluidity on race morning. Bring an extra pair of running shoes, clothes and food. Transition areas can close long before your own race start or be inaccessible after a race. Being able to warm up on your own schedule and then have dry clothes and food after is essential. Having seamless, fast transitions doesn’t happen by accident. Know your course, practice before race day and keep it simple no matter what the race distance. Follow these guidelines and then race fast! Read part two of the Transition Clinic, which focuses on T2 (bike to run).